Gesture typing allows you to type words by simply swiping to connect their letters, saving you precious time over touch typing, but that extra speed comes at a cost: gesture ambiguity. Many words such as "or" and "our" shown at left have identical gestures, and many more such as "singer" and "sinner" shown at right have very similar gestures. Most of these problems are caused by how letters are arranged on QWERTY, the standard keyboard layout. By optimizing the keyboard layout for word gesture clarity (distinctness), typing speed, and learnability, we have created new layouts that allow you to gesture type faster and more accurately than ever. This work was performed at Google Inc. while Brian A. Smith interned there. "Optimizing Touchscreen Keyboards for Gesture Typing,"
Here are two of the keyboard layouts that we optimized for multiple dimensions (gesture clarity, speed, and learnability) at once. The top row represents GK-D ("Gesture Keyboard—Double Optimized"), which was optimized for gesture clarity and speed. The bottom row represents GK-T ("Gesture Keyboard—Triple Optimized"), which was optimized for all three dimensions. As with the image of QWERTY above, we compare the word gestures for "or" and "our" (left column) and "singer" and "sinner" (right column). On average, word gestures on these layouts are shorter and more distinct than they are on QWERTY. 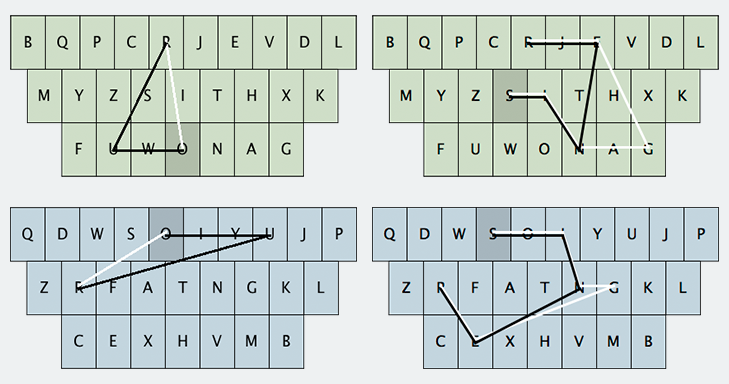 Here are the keyboard layouts that we optimized for each dimension (gesture clarity, speed, and learnability) exclusively. At left is GK-C ("Gesture Keyboard—Clarity"), which was optimized for gesture clarity only. In GK-C, common letters are arranged far apart from each other in a radial fashion, making word gestures more distinct. At right is GK-S ("Gesture Keyboard—Speed"), which was optimized for gesture speed only. In GK-S, common letters are clustered close together, keeping word gestures short but ambiguous. The layout optimized for learnability is simply QWERTY itself. Through the course of the optimization, we also discovered how the dimensions interact with each other in the optimization space. Of the 900,000+ keyboard layouts that we tested in our optimization, there were 1,725 layouts (shown here) that were Pareto optimal, meaning that none of their performance scores (which range from 0 to 1) for the three dimensions could be improved without hurting the other scores. 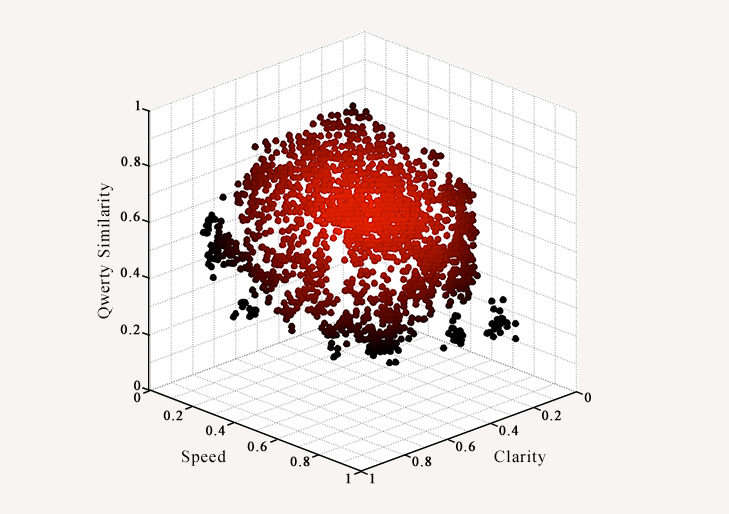 These layouts are at the cusp (or Pareto front) of the optimization — each layout is better than the others in some way, and the tradeoffs that are inherent in choosing a suitable layout are reflected in this plot's convex shape. In the plot, layouts with lighter colors are farther from the origin. Both GK-D and GK-T are very near the middle of the convex surface. The 14-minute conference presentation given at CHI 2015.